It’s time to go to the beach! The water temperature has changed, and it is perfect. The weather has been pretty perfect too even though we’ve had some hot days and some very annoying windy days. Every day I think about just heading to the beach, setting up my shade and enjoying some ice cold cervezas and some aguachiles…but, unfortunately, it’s only Tuesday and I’m at work, so I will have to wait until the weekend is here. But for those of you who can come and enjoy the beach during the work week try snapping some great photos and sending them our way – you never know, yours might made the cover! I hope you are all doing well. 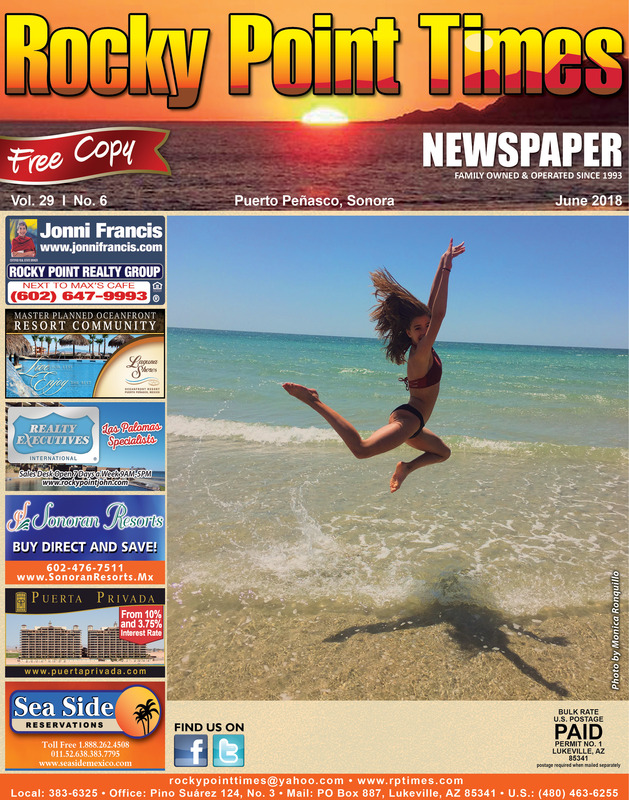 We have been working hard here at the Rocky Point Times getting many visitors and a lot of people coming in to get some free books – probably to read at the beach! In case you didn’t know, we have a free book exchange library here at the office and you don’t need to bring a book to take one. It’s sad to see many of the RV’s and snowbirds go back home, but we will happily see them return once again in the fall. Summer is considered to be our “slow season”, but in the last few years we have seen an increase in tourists, both national and international. Many come to Peñasco this month since school is out and we love to see everyone out enjoying the beach, eating at our local restaurants and doing lots of shopping. June 17th is Father’s Day and, just like Mother’s Day, there will be many restaurants and bars having specials, so be nice and take your Dad out for dinner or for a cerveza or maybe some good birria tacos or carne asada tacos. I know here in Mexico we celebrate Mother’s Day more than we celebrate Father’s Day, but I think we should be celebrating it the same way!! Happy Father’s Day to my Dad and all of you Dads out there. Many people are asking us about the Cruise Ship Home Port so be sure to read the article in this month’s issue: Word is that it will get a private investment. We would really like to see it finished as it will generate more jobs and will benefit everyone – on both sides of the border. During the Arizona-Sonora Commission the finish date was going to be in 2020, but we have not seen any movement lately in the area, so we shall wait. We all believe that it will become a reality – we just don’t know when. Many big projects coming to our small city; one of them will be a 120-room hotel; and another will be a concert area located across from the Sonoran Sea. We’ll be sure to give you more information as it becomes available. I sure would like to see some more investment in the Mirador Area. It has been kinda quiet the past few years considering it used to be one of the most popular areas of our city. Currently, the Pink Cadillac and the American Legion are major draws to the area as well as the Baja Cantina and now with the re-opening of Manny’s Beach Club, hopefully we will see the Mirador be like it was back in the good old days. I would like to give a small update on my friend, Anthony “El BomBon Chavez”, even though he was not able to fight in Mexicali, he did have an exhibition fight here in town last week. He is only 10 years old, in the 4th grade and was born in Cottonwood, AZ, but is living here in Rocky Point with his family. His father is the owner of Clipper’s Barber Shop and he works hard every day to help him succeed and has created a Boxing Club called “La Familia”. Anthony is very disciplined, dedicated and has a lot of support from his family, friends and many local sponsors. We would love to one day see him fight in Las Vegas, but for now we wish him all the best in his young career. We will be posting the info about his next fight on our Facebook page so you can go out and support him. Don’t forget that next month, on July 7th, is the 7th Annual Las Vegas Night for Charity at the Sonoran Sky Resort. The Sonoran Resorts work very hard to organize this fun event that benefits various local charities. Even if you don’t like to gamble you can come and enjoy friends, food, drinks and music – and I will always be happy to take your gambling chips off your hands! The event seems to get better and better each year and all the Las Vegas style table games are a lot of fun! On a final note, grapes are in season this month and next month: The Coast of Caborca has a lot of agriculture and besides growing asparagus, it also grows grapes, so you will soon see many people and businesses selling our delicious grapes. Hope to see you in Rocky Point!